As you may or may not know, there are 2 people running our Etsy shop: me (Inez) and my Mama, Mariann. This means that our capacity is limited as most of our items are mostly handmade and our hands need a bit of resting too now and then. Due to social media popularity (Pinterest & Instagram) we are constantly flooded with orders, so our production times are long for certain products like our nursery mobiles. Here is a list of the most important questions you may have regarding our production times for items sold in our Etsy shop called BohoBabyHeaven. Production times differ for all types of products. They are specified in each listing on Etsy. What you see, always applies! Please make sure that you check this info BEFORE placing your order to avoid dissappointment. Where can I check production times? When you view or purchase a listing, it has info on average shipping times & the exact production time. Please check these on the listing before you place order. 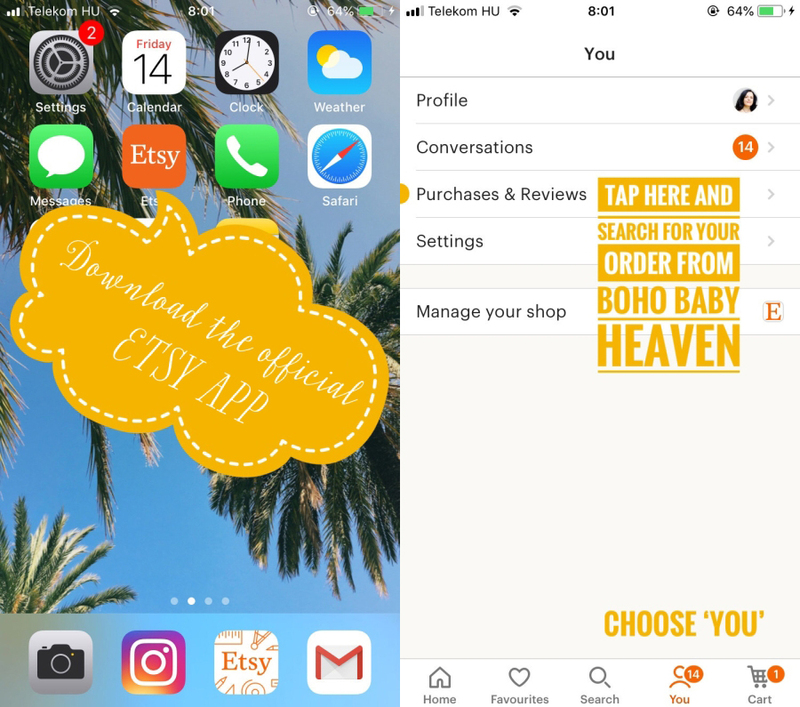 Once ordered, if you download the official ETSY APP, you can check the ‘Purchases & Reviews’ section of your profile to see how many days are left till your order ships. We are unable to rush orders, but please contact me in case you have any issues or questions. Why does it take so long to get my nursery mobile or other product? Because there is just me and my Mum to make these and we are constantly flooded with nursery mobile orders due to huge traffic. Our mobiles are the top pinned boho baby nursery mobiles on Pinterest and we were also featured on the official Etsy Instagram feed recently. It grew our number of followers significantly, leading to record sales. We are sorry about the long waiting times and we work very hard to finish and ship all orders asap. Do you have ready to ship (RDS) products? Hardly. Whatever we do, it is sold out in mins. We have been unable to go under 50 orders lately, no matter how hard we work. We appreciate your patience and understanding so much!